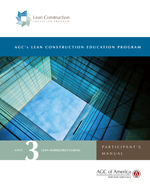 The goal of Lean Design and Pre-construction is to broaden the participants' awareness of applying lean practices in the project design and pre-construction phase to minimize waste and maximize value to the project. One of the goals of lean principles is to standardize as many of the project operations as possible for greater reliability and consistency. Following this course, participants will be able to: o	Distinguish between the varying definitions for design. o	Define value and commonly used methods to maximize it. o	Discuss waste and commonly used methods to minimize it. o	Differentiate between traditional project methods and lean design. o	Explain the various lean tools used in design and how to deploy them.